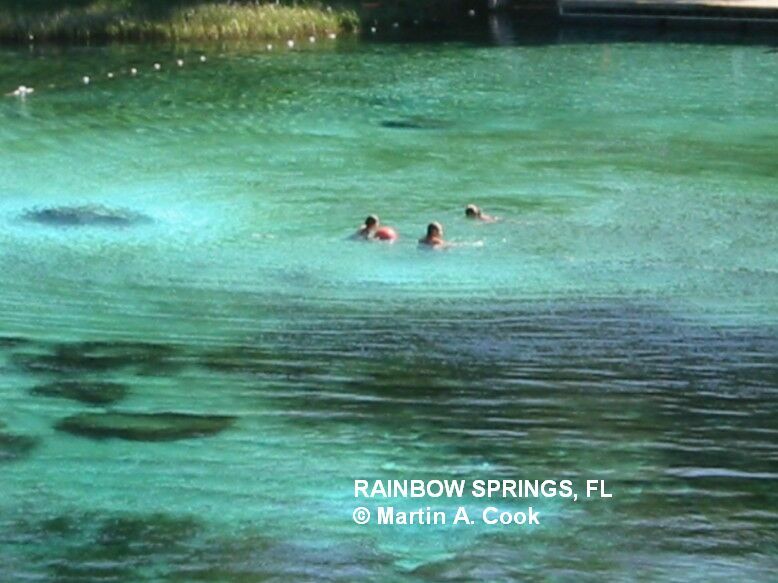 There are countless (well, almost) springs in Florida that have great swimming, snorkeling, scuba, tubing and canoeing. This web site covers some of the most popular and accessible but the links below are quite comprehensive - give them a click! 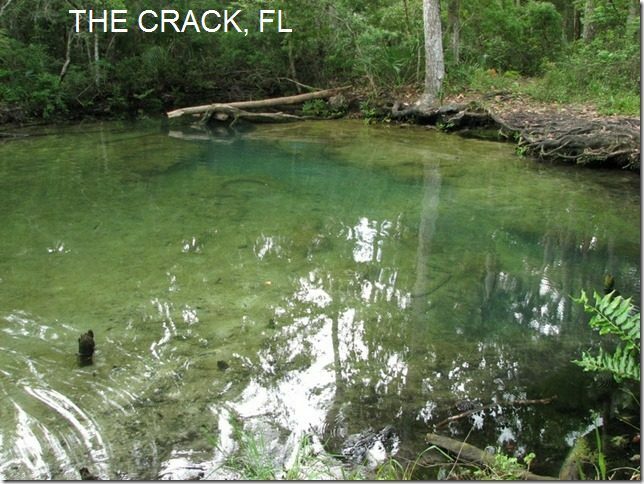 Several springs in the area north of Apopka. See DIRECTIONS below for details. 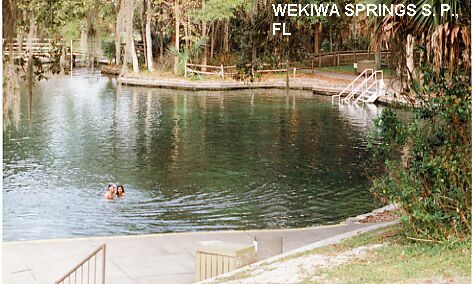 WEKIWA SPRINGS S. P. [WEKI]: Wekiwa Springs are in suburban Orlando but surprisingly beautiful and a great swimming/snorkeling place. Acres of terraced green lawn for sunning and funning. PHOTO 1 , PHOTO 2. Phone(407)884-2008. Camping at site. WEB SITE AND PHOTO. LAT, LON lat=28.7119, lon=-81.46(source: Springs web site) (accuracy: exact) LINK TO GOOGLE MAP. To get here from Apopka, take RT 435 north then Welch Rd. east, jog north then continue on Wekiva Springs Rd. east to signs for the springs. Verified. Very confident. Updated 2/10/2005. 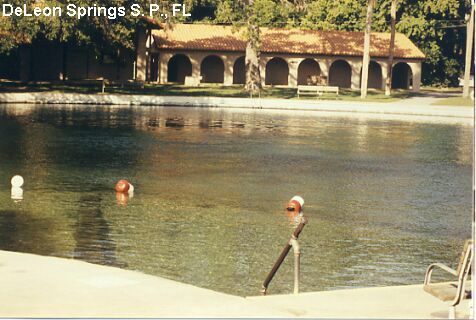 ROCK SPRINGS S. P. [ROCS]: (Also named "Kelly Park") Swim and tube. IS SOMETIMES CLOSED DUE TO BACTERIAL COUNT FROM ANIMALS. This from a visitor:� I just wanted to say that it is a great place to swim. Very popular with the locals and visitors. My grandparents swam there when they were young. I just wanted to let you know that it is a great place to swim and it is very clean and has a nice campground. Tubing is popular and the run starts at the cave to the right of the parking lot. The cave is barred for no entry. The water is deceptively clear...the water deeper than it looks. But cold, fresh and wonderful on a hot Florida day. The inner tubes can be rented outside the park at a couple of gas stations for a pretty cheap amount. Or you can take your own. The current is lazy, but strong enough to propel you downstream without having to kick your feet. There is a clean kiddie beach in a shallow part that is away from the diving and tubing." STILL MORE ON THE WEB . LAT, LON lat=28.75758, lon=-81.50136(source: DeLorme) (accuracy: exact) LINK TO GOOGLE MAP. To get here from Apopka, take RT 435 north for 5.9 mi, turn east at Y junction on paved road 0.5 mi to Kelly Park parking lot; the springs are to the south. Not verified. Very confident. Updated 2/10/2005. 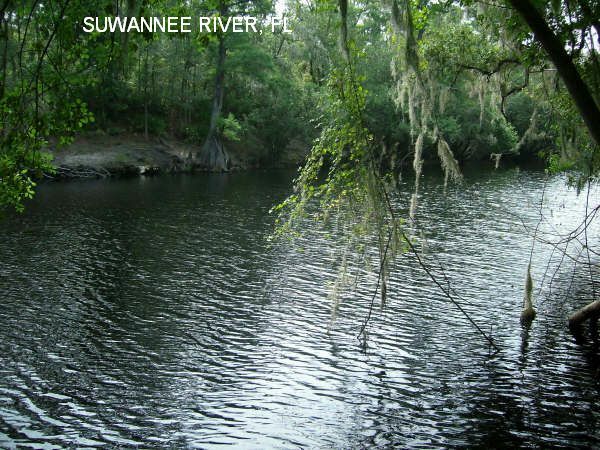 Walking trails in State Park with opportunity to take an (unofficial) dip in the famous Suwannee River. Here the river has rapids (in Florida!) and bluffs. State Park website. There are alligators in this river - see Alligator safety cautions. 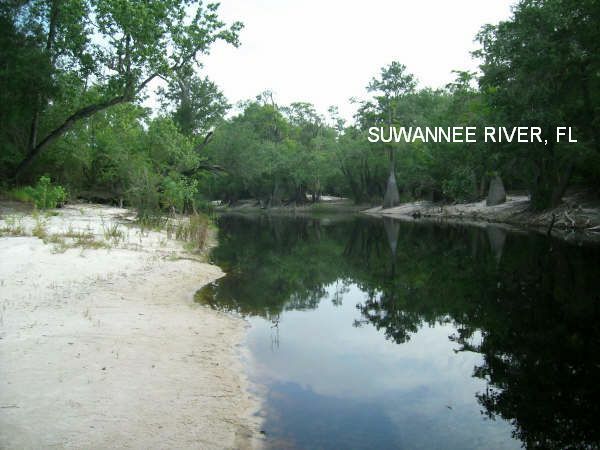 This from a visitor: "Here along the famous Suwannee River you can find a few places to swim clothing optional. From White Springs Take SR-135 north a couple miles to where you see the cutoff for Big Shoals State Park, which offers trails to hike along the Suwannee which are seldom visited. There are plenty of places to skinny dip along the banks including the Kayak-Canoe launch ramp, when not occupied. 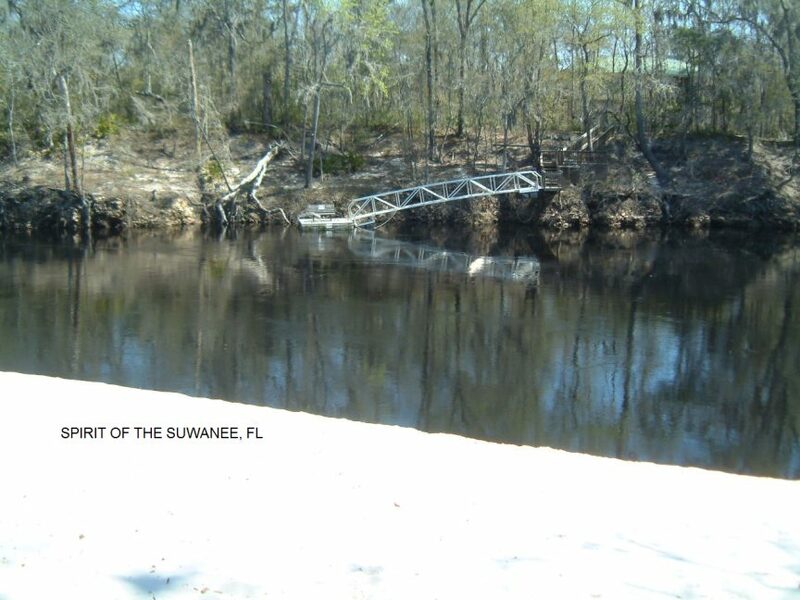 On up further, where SR-135 ends and intersects at SR-6, a dirt road continues on up along the Suwannee where a boat ramp about � mile further up also offers a place to skinny dip the river." Big Shoals S. P. and Little Shoals S. P.
From Florida State Parks Web Site: " Blackwater River State Park is an outdoor delight found in northern panhandle of Florida. Surrounded by Blackwater River State Forest, this park enjoys a long shoreline along one of the world's purest sand bottom rivers. Well known for canoeing, the park and surrounding forest have many miles of canoe trails including those on Sweetwater, Juniper and Coldwater Creeks. Hikers can enjoy viewing white sand beaches, longleaf pine forests, cypress swamps and a smattering of American white cedar woodlands. The following is from a fan: "My husband was raised in the Milton, Florida area. He learned to swim in the Blackwater River. Anywhere you can park and walk to the river (not a tough thing), you can swim. Most of the river in the park is less than two feet deep. There are some deep holes at the inside of the bends. You can spot them because the usually have a sandbar across from them on the outside of the same bend. In the shallows the water is clear with a brown tint and you can see the bottom. There are very few obstructions. The water moves fast in the deeper parts so keep an eye on little ones or they can float off quickly. But it is much slower in the shallows and near the sandbars making it a good swimming river for families. Near the entrance to the park, Deaton Bridge is actually a good spot to swim. There is parking on either side of the bridge"
Thirty campsites, with electric and water hookups, are available in state park. From Pensacola, take I-10 east to Milton then take RT 87 north for two miles. Go east on RT 90 to Harold. Turn left on Deaton Bridge Road. This takes you straight into the park entrance. Deaton Bridge is actually a good spot to swim. There is parking on either side of the bridge. 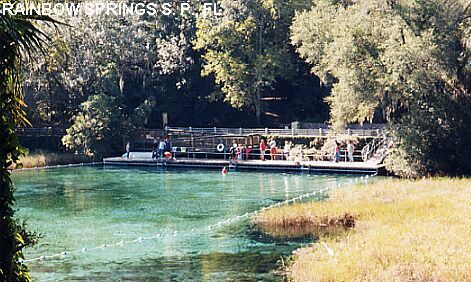 Blue Springs arises from a yawning cavern at the bottom of a transparent pool and runs as a broad stream about a 1/2 mile into the St. Johns River. The spring is sensitively developed but very accessible, with a raised boardwalk along much of the run. Elderly or disabled visitors, including wheelchair users, will find it very user friendly. The walk itself is a treat, through a shaded, tropical corridor with frequent views of the spring and several easy access points for swimmers. You can swim or snorkel down the run, letting the gentle current carry you along, under overhanging trees and Spanish moss. In winter, you may find manatees here - the state requires you to keep your distance from them when swimming. 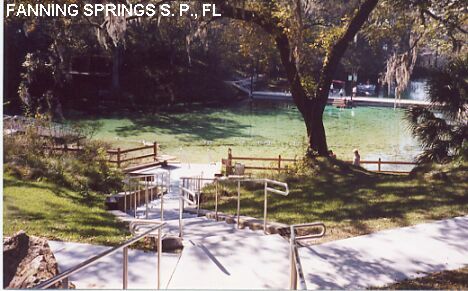 Ocala N.F., Blue Spring S.P. At site, in Blue Spring S.P. Phone (904)775-3663. From DeLand, about 5 mi south on RT 17/92 to signs for Blue Springs S.P., near Orange City. Part of a Federal reserve, these 2 areas are traditionally clothing optional beaches. They are NOT easy to get to and have VERY limited facilities and parking. Read these BEFORE going: PLAYALINDA BEACH 1 , PLAYALINDA BEACH 2 , Canaveral National Seashore. .
No beach camping, camping is permitted by permit on islands in the Indian River Lagoon that are accessible only by boat. APOLLO BEACH [APOL]: Part of a Federal reserve, south of parking lot #5 is a traditionally clothing optional beach. It has VERY limited facilities and parking. Read the website articles above BEFORE you go. To get here, from I-95, take exit #49 headed east on RT 44 towards New Smyrna Beach. (NOTE: Be aware there is a town called Apollo Beach on the Gulf side of the state. For GPS navigation instructions, you can enter the community of Bethune Beach which will put you a couple of miles from the entrance.) Stay on this road which will turn into A1A south and lead directly to the park entrance. There are 5 parking lots spaced about 1.5 miles apart, each with only about 30 parking spaces. Go early due to the limited parking, take water to drink, suntan lotion and bug repellant as well as some form of shade. If lot #5 is full, rangers generally allow one car to wait at the turnaround; otherwise they will make you move. You can drive back north. It is a common courtesy for locals to give others a ride down to #5. Travel light in case you have to walk . Once you reach the beach and are facing the ocean, turn to your right and walk. You will have about a mile of clothing optional beach to enjoy; but do not go past the Backcountry boundary sign unless you have purchased a Backcountry permit ($2/person). LAT, LON lat=28.929895, lon=-80.822725(source: measured by another) (accuracy: approximate) LINK TO GOOGLE MAP. Very confident. Verified by another. Updated 2/2011. PLAYALINDA BEACH [PLAY]: Part of a Federal reserve, north end is a traditionally clothing optional beach. It has VERY limited facilities and parking. To get here, from I-95, continue south to Titusville, take Max Brewer Memorial Pkwy (RT 406) east across the bridge to Merritt Island. Keep right onto RT 401/402 toward Wilson and the Canaveral National Seashore. When you get to the beach, turn north (left) and go about 5 miles north to the northern end of the beach. Go early, parking is limited, take water to drink and shade but travel light because you may have to walk a good way if you want to get to get to the clothing optional area at the north end. Read the website articles above BEFORE you go. Very confident. Verified by another. Updated 2/2011. LAT, LON lat=28.702965, lon=-80.665730(source: measured by another) (accuracy: approximate) LINK TO GOOGLE MAP. 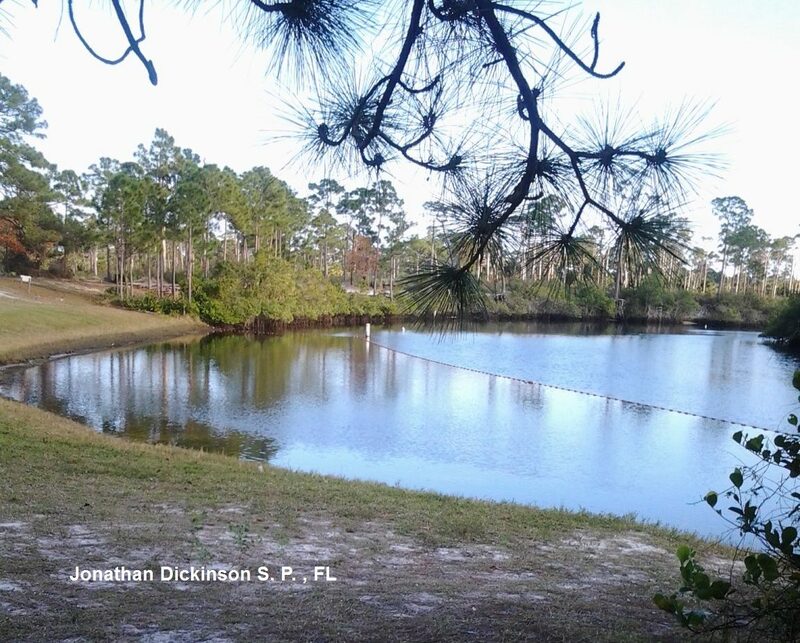 Chassahowitzka County Park is here, has camping. Many mosquitoes. From the town of Crystal River, go south on RT 19/98 about 13 miles to where RT 98 splits off to the east (left). At this junction, go west (right) on RT 480 (W. Miss Maggie Drive) and go about 2 miles to the Chassahowitzka River Campground (county park). Here you rent a canoe or boat and paddle to the springs below. There are many springs, some with alternate names, below are just a few. Be sure to get a map of the river and springs from the park office. ONLINE MAP. SOLUTION HOLES [SOLU]: (A popular place called "Seven Sisters" is very near here also) Also known as "Devil's Punchbowl". PHOTO . 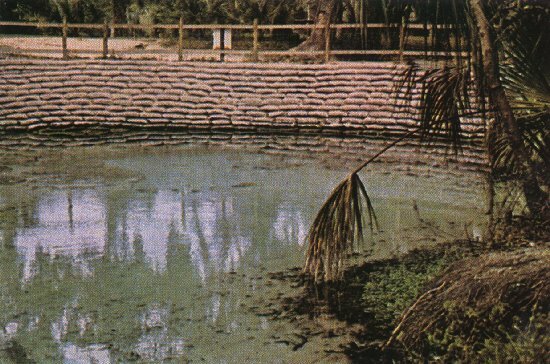 Information from Springs Fever web site: "From the boat ramp, go upstream to the right (east) behind the main spring basin and into the manmade channel about 50 feet. Turn left into run and the solution holes are in the run. Many people swim here - the holes are like tubs, people get in them and swim between them underwater - YOUTUBE ." LAT, LON (of spring) lat=28.715, lon=-82.5764 (of spring) (source: Spring Web Site ) (accuracy: approximate) LINK TO GOOGLE MAP. Pretty confident. Verified by another. Updated 9/2014. HOUSEBOAT SPRINGS [HOUS]: Information from Springs Fever web site: From the boat ramp, go downriver about .3 mile and look for spring basin opening on the left (south). It is circular bay. about 150 feet in diameter and over 20 feet deep. Swimming and snorkeling. LAT, LON (of spring) lat=28.71530, lon=-82.58333(source: DeLorme ) (accuracy: approximate) LINK TO GOOGLE MAP. Pretty confident. Verified by another. Updated 9/2014. BLUE SPRING [BLSP]: (A popular place called "The Crack" is very near here also) PHOTO .Quoted from Springs Fever web site: "From the boat ramp, go downriver about .5 mile and then turn south (left) into either of two openings of Baird Creek, which flows around a tiny island at the mouth of the run. Paddle up main channel for .5 mile to the Blue Spring basin. The basin is basically at the head of the run, although there are 2-3 smaller basins to its immediate right (west) and a small run at the back of Blue Spring that winds back another 200-250 yards to The Crack (a.k.a. "Miss Maggie's Crack"). The spring forms a large circular basin that is about 100 feet across and 25 feet deep." Swimming and snorkeling. LAT, LON (of spring) lat=28.70897, lon=-82.58001(source: DeLorme ) (accuracy: approximate) LINK TO GOOGLE MAP. Pretty confident. Verified by another. Updated 9/2014. Can swim/snorkel/scuba very close to or actually among manatees in winter months (mid-Nov to mid-Mar - Jan and Feb are best). 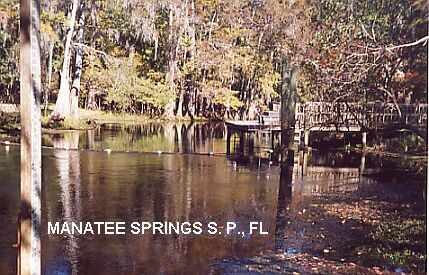 Need a boat to get to the manatee place (at King's Spring) but it is a very short distance. A rented john boat or canoe will do but a larger party might want to rent a pontoon boat. Nearby at Rainbow Springs S.P. From Ocala, go west on RT 40 to RT 41. Go south on RT 41 (past Rainbow Springs, also a swimming hole, see elsewhere) to RT 488 at Dunnellon (just after you cross the river). Take RT 48 southwest to RT 495, then RT 495 south to the town of Crystal River. Go south on RT 19 through Crystal River, along here you will see signs to the dive shops. DeLeon Springs arises from a cavern at the bottom of a transparent pool. The spring is bordered with concrete and stone looks like swimming pool except that the bottom is all natural. The park also has a famous pancake house, from 9:00 AM. LINK TO STATE PARKS WEB SITE. None at site. 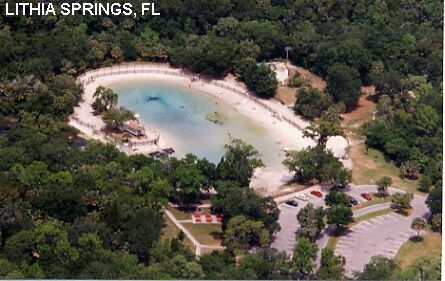 Go to Juniper Springs (see below) in Ocala N.F. for camping at beautiful sites. DeLand, go 6 mi north on RT 17, see signs. Econfina Creek is part of the Econfina Creek Water Management Area (WMA), which provides a linear park along the creek with a foot trail most of the way. Econfina Creek offers the steepest gradient of any designated canoe trail in the state. Canoeists pass waterfalls, rock outcrops, log jams, riverbed springs and plentiful bird life. The coordinates above and directions below are for two of the auto access points to the creek. This from a local:� The Pitt Spring Rec site is a new "mini state park", very nice with restrooms/changing rooms, tanning decks, picnic area, and some parking. I would call it a "wading hole" - it is a spring hole with just a small (6 ft diam?) 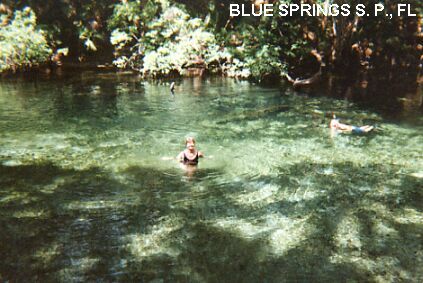 blue spring hole, a 200 ft or so diam walled sand bottom wading circle, and a short spring run to Econfina Creek, which creek is about 50 ft wide and 2-3 ft deep. The others are just unimproved spring runs as far as I know, haven't visited all. They are also used for kayak/canoe put-ins for a popular paddle route down Econfina from SR 20 to CR 388. One of them is controlled by the state and has parking, trash cans, etc." Developed camping at Walsingham and recreation areas north of Walsingham. From Panama City take RT 231 north about 25 miles then RT 20 west about 7 miles to where it crosses Econfina Creek at Pitt Spring Rec Area, where there is swimming. To get to Walsingham Rec Area, continue west a very short distance then turn north (right) on Strickland Rd (unpaved) (past the canoe rental place) and continue onto Porter Pond Rd turn right on Hampshire Blvd then right on Walsingham Bridge Rd to Walsingham campground. From there, there is a gravel road going north on the east side of the creek to Longleaf, Seashell and Devils Hole Rec Areas, some of which have swimming. This from a visitor:� This is a glorious, resplendent hideaway near the University of Central Florida. A combination of students, alternative culture types and outdoorsy folk visit regularly. There are high schoolers and some families on the weekend afternoons, when skinny dipping may not be acceptable. If others are there, just ask permission and normally they say "do what you do" or "doesn't bother me". There is a very mellow, tolerant vibe and visitors tend to accept the chosen activities of others without much notice. The best hours for visiting are between 11 am and 2pm as high school students and others may congregate after school and during summer months, usually late in the afternoon. They aren't too rowdy but they do put a crimp in the freedom quotient." "
"There is the possibility that alligators will stray into any waterway in Central Florida, but I have never seen one here in 2 years and veterans of 8-10 years say that have not seen gators ever. Central Florida does have some aquatic snakes but these are rare as are water moccasins. The water is crystal clear with a sandy bottom in many places, so a swimmer would have plenty of visibility to see a snake in the water and take evasive action. Again, no one has seen a poisonous snake here but, in Florida, a variety of snakes abound. " Directions: From downtown Orlando, take RT 408 east then RT 417 north then University Blvd east to Rouse Rd. The swimming hole is located at the rear of the Wendy's parking lot on University Blvd near Rouse Rd. near the campus of the University of Central Florida. Park well off the road at least 300 yards from the intersection to keep patrol officers happy. There are mowed indentations on the west side of the road and plenty of safe, shaded parking areas on the east side of the road near a manicured retention pond near an office building complex. At the rear of the Wendy's parking lot is a chain link fence gate just jump over the short cement wall and onto the path and follow the path to the creek bed where you will find beautiful and gargantuan cypress trees and the swimming hole/pond. "PARKING CAUTION: Do not park at Wendy's unless you also purchase goods at the restaurant. Wendy's is generous about looking the other way and will continue to do so unless the parking lot fills with non-customers. Several lots in the area have tow away zones so be cautious of this also." TURKEY CREEK [TURK]: Just north of Valparaiso there is a local swimming hole in Turkey Creek (this is also a Geocaching Site .) No details on how to get there - use the coordinates and happy hunting! LAT, LON lat=30.525194, lon=-86.502472(source: Geocaching web site) (accuracy: approximate) LINK TO GOOGLE MAP. 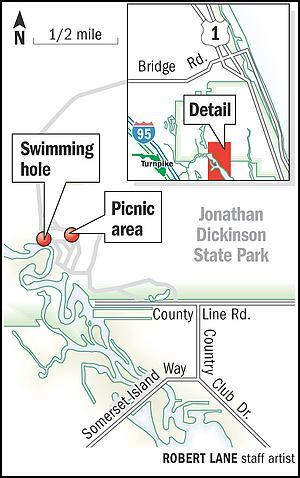 "A general recreational permit is required for civilians to access Eglin Air Force Base's land, streams, and water impoundments or to use its camp grounds, swimming holes or to hunt on it during the various game seasons. A general access permit and a map will be issued to anyone over 16 years old that can pay $5.00 and show valid identification, e.g., a driver's license, voter registration, etc. The permit is valid from October 1 through October 1 of the following year, regardless of the date of issue." "Eglin AFB, an area of over 700 square miles, has been supporting all the Military Service's ordnance testing and training since 1939. It is also the home of several on-site USAF Combat and Special Operations Wings. The U.S. military uses vast areas of it for weapons training year round. All weapons ranges are strictly off limits because of the real danger of unexploded ordnance. All such areas are clearly marked on the map, posted and patrolled." "Permits are issued from one office only; Eglin AFB Natural Resources Branch (Jackson Guard Office) located at 107 Highway 85 North, Niceville, Florida 32578. Office hours are: Monday through Thursday, 07:00-16:30. Friday, 07:00-18:00. Saturday, 07:30-12:30. Closed Sunday and Holidays. Telephone: 850-882-4164." Swim in beautiful, clear spring, diving platform also. LINK TO STATE PARKS WEB SITE. 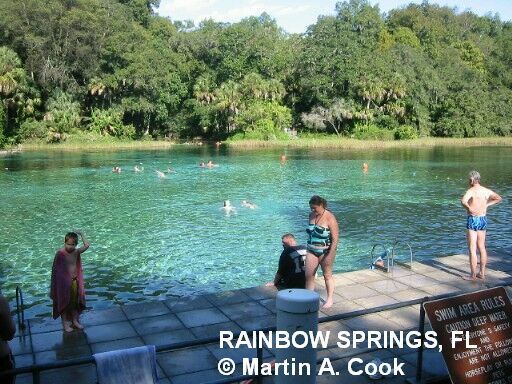 None at site, camp nearby at Manatee Springs S. P.
Swim in beautiful, clear spring in (or near?) State Park. Also, there is an impressive caverns here you can visit. LINK TO STATE PARKS WEB SITE. A lengthy canoe trail begins here on the Chipola River and goes south for many miles along this river. See also "LOOK AND TREMBLE FALLS" swimming hole which is south on this river. Nicely developed camping at State Park. Camping at the site, full hook ups. A number of clear, cool springs very close to each other northwest of Gainesville. For details, see DIRECTIONS below. 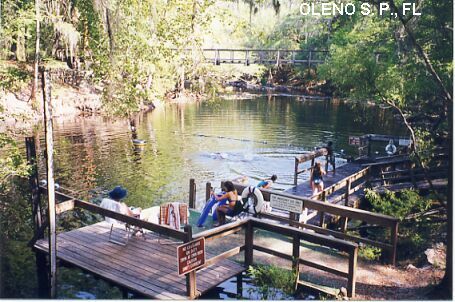 Camp at Oleno STATE PARK nearby or Manatee Springs S.P. BLUE SPRINGS 2 [BLU2]: Privately owned spring. Local web site says: "Family owned and operated since 1958 with 250 acres of the "Real Florida". Stroll along .25 mile boardwalk as it follows the springs run into the scenic Santa Fe River, or gaze into the crystal blue depths from the dock overlooking the springs boil. A dip into 72 degree water is sure to leave you feeling refreshed and recharged." Toilet, Changing Room, Picnic Tables, Swimming, Snorkeling, Tubing, Camping. Fee. (386)454-1369. WEB SITE AND PHOTO. LAT, LON lat=29.8299, lon=-82.6828(source: DeLorme) (accuracy:exact) LINK TO GOOGLE MAP. To get here: from High Springs, take RT 340 west to signs for Blue Springs. Not verified. Very confident. Updated 2/22/2003. GINNIE SPRINGS [GINN]: Privately owned spring. Very beautiful and well known. Strong water flow, gin-clear water, interesting bottom. Scuba diving place. Fee. LINK TO WEB SITE AND PHOTO , YOUTUBE . LAT, LON lat=29.8368, lon=-82.7038(source: DeLorme) (accuracy:exact) LINK TO GOOGLE MAP. To get here: from High Springs, take RT 340 west (past Blue Springs) to signs for Ginnie Springs. Partially verified. Very confident. Updated 2/22/2003. YOUTUBE . LAT, LON lat=29.9838, lon=-82.7603(source: DeLorme) (accuracy:exact) LINK TO GOOGLE MAP. To get here: from High Springs, take RT 27/20 northwest to signs for Ichetucknee Springs S. P. Verified. Very confident. Updated 2/22/2003. Freshwater grassy beach on a river. Closed for 18 years due to water quality problems. Recently reopened after effort to clean up water. See LOCAL AREA MAP above. LINK TO STATE PARKS WEB SITE. From Stuart (south of Port Saint Lucie), go 12 miles south on RT 1 to the State Park. LAFAYETTE BLUE SPRINGS S. P.
Official swimming place in beautiful spring in unspoiled State Park. LINK TO STATE PARKS WEB SITE. Walk-in (tent) camping at site. From Lake City, take I-10 west to Exit 283 then RT 51 southwest through Live Oak to Mayo. 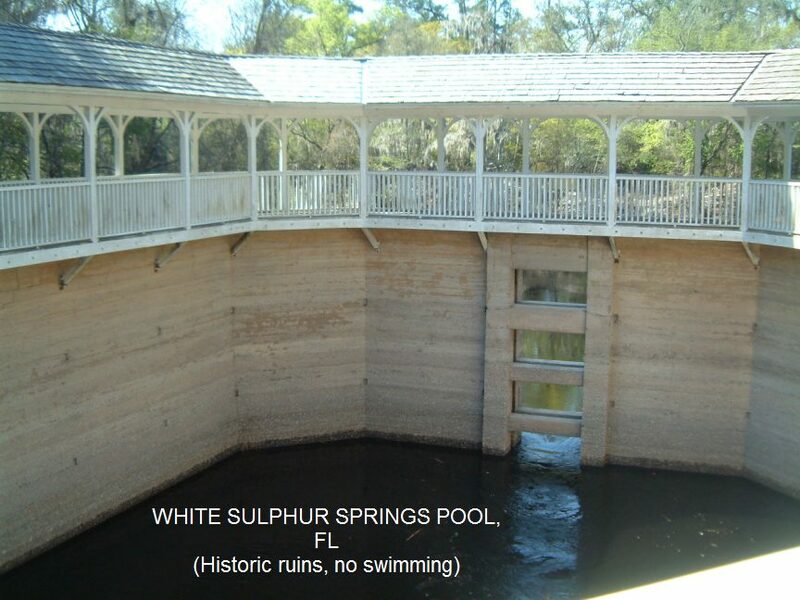 Lafayette Blue Spring is located 7 miles northwest of Mayo on the west side of the Suwannee River. From Mayo, drive northwest on RT 27 for 4.3 miles. Turn right on CR 292 and continue for 2.1 miles. Turn east on Blue Springs Road and go 0.2 miles to the park entrance. Not really a swimming hole but a lovely county park with swimming beach on spring-fed lake and several fun waterslides. Swimming area is closed in the winter, from approximately October/November to May. LINK TO STATE PARKS WEB SITE. From Florida Turnpike south of Miami, take exit 13 then go 1.3 miles west on Eureka Drive (184th st) to the park on the right. From Brandon (south of Tampa), go east on RT 60 about 15 mi, turn right on RT 39 to Lithia. 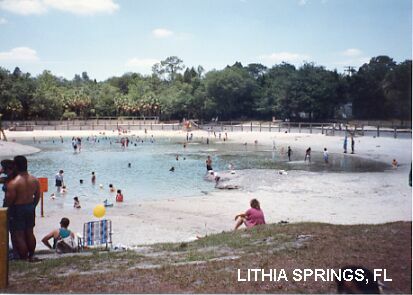 Lithia Springs is about 3 mi west of Lithia. 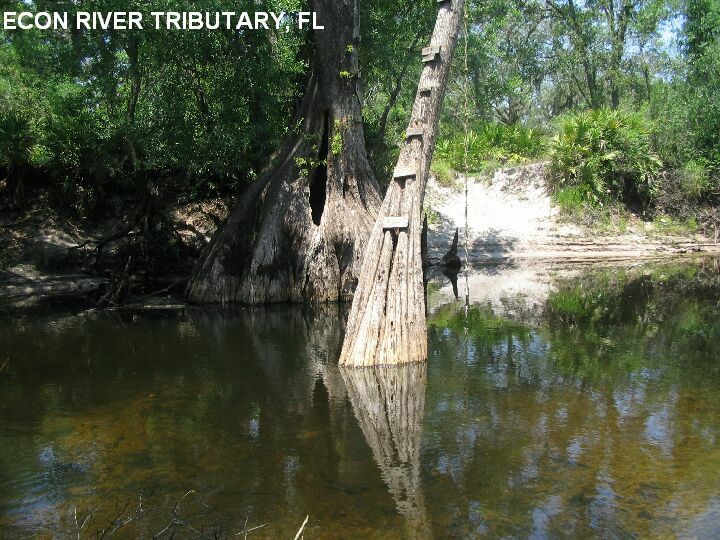 Drive 0.6 mi southeast from the Alafia River Bridge on the Pinehurst- Lithia Road, turn right (west) onto a paved road and continue 1.4 mi to the springs. Rapids on the Chipola River, which is a Florida canoe trail river, beginning at Florida Caverns S. P. north of here. This according to a local fan:� It has a limestone bottom with lots of deep holes, so wear some shoes to protect your feet, and bring a diving mask to look under the surface. The especially interesting part of Look And Tremble is that the holes in that rocky bottom catch and hold both Indian artifacts (projectile points, etc.) and fossils (pieces of manatee ribs, etc.) as they wash downstream." See also "FLORIDA CAVERNS S. P." swimming hole north of here on the Chipola River. Nicely developed camping at Florida Caverns State Park north of here. Go west on I-10 from Tallahassee. Get off I-10 at RT 71 near the town of Marianne and take RT 71 south to Altha. In Altha, take RT 274 west about 4 miles to where it crosses the Chipola River. The swimming place is near this bridge. BE CAREFUL - THERE MAY BE STRONG CURRENTS HERE DEPENDING ON WATER LEVEL. 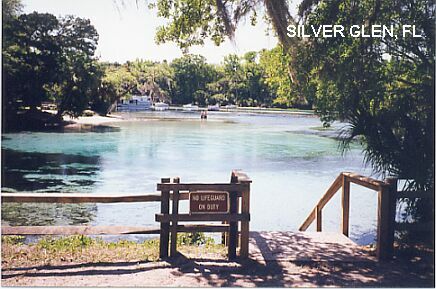 Swim in Manatee Springs, snorkel and scuba in Suwannee River.LINK TO STATE PARKS WEB SITE. From Gainesville, go west about 33 miles on RT 26 to Fanning Springs. (See also "Fanning Springs" swimming place.) 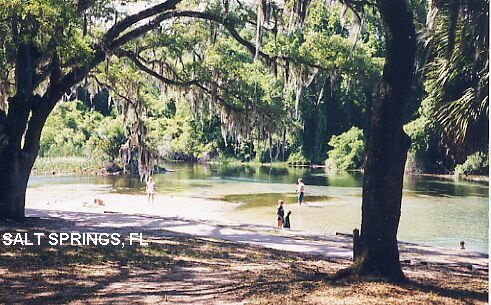 From Fanning Springs, go south on RT 19 about 10 miles then west on RT 320 to Manatee Springs S. P.. 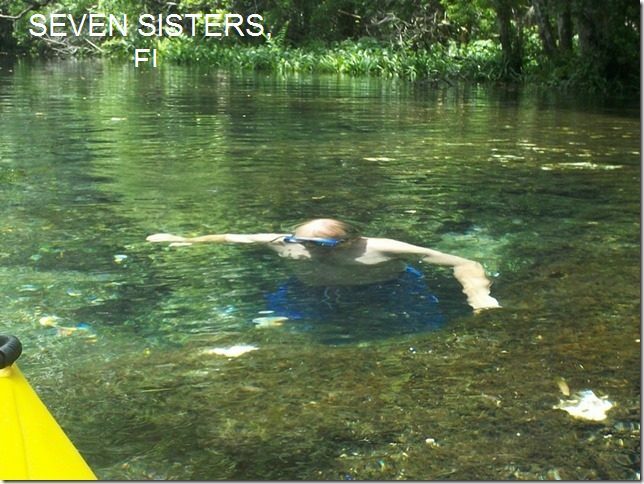 There are several beautiful, clear springs in the Ocala National Forest. At a constant 72 degrees all year round, they are a brisk delight in any season. See "DIRECTIONS" below for details. Toilets, Picnic Tables at most - see below for exceptions. See above, camping at all but Silver Glen Spring. All of these springs are off of RT 40 between Ocala and Barberville in the Ocala National Forest. Directions are given in sequence as you proceed west on RT 40 from Barberville. 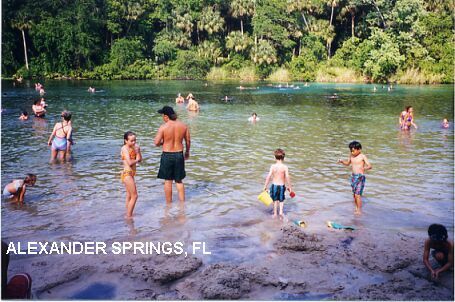 ALEXANDER SPRINGS [ALEX]: Popular spring for swimming, snorkeling, scuba diving into cave at bottom. Camping at site in very lovely, tropical setting. PHOTO. LAT, LON lat=29.08036, lon=-81.57808(source: DeLorme) (accuracy: exact) LINK TO GOOGLE MAP. To get there: From Barberville, go west on RT 40 to Astor Park. Go south on RT 445 to signs for Alexander Springs Recreation Area. 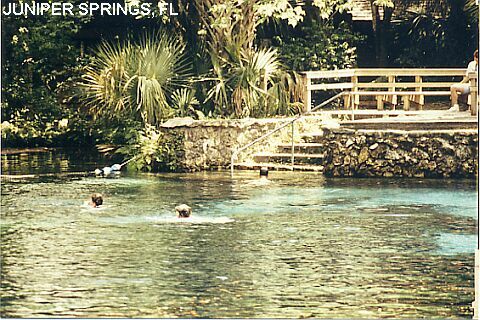 SALT SPRINGS [SALT]: Very large, very popular spring for swimming, snorkeling. Was closed for a period but is reopened as of 3/25/2012. Fee $5.50 per person in 2012. PHOTO 1 , PHOTO 2 , PHOTO 3 . All faculties. 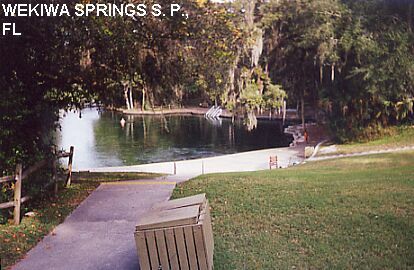 Here is a report from a visitor:� Salt Springs was especially interesting because it has such a high mineral content that it is, essentially, "salty". Enough so that sea animals such as mullet and Atlantic blue crab live there, even though it is more than sixty miles from the ocean. Amazing. My wife had to practically pry me out of that place. I couldn't swim there enough.". Camping at site, not very well wooded. LAT, LON lat=29.3536, lon=-81.7404(source: DeLorme) (accuracy: exact) LINK TO GOOGLE MAP. To get there: Continue north from Silver Glen Springs on RT 19 to just past the intersection with RT 314. Access to spring is just ahead. BLUE SINK [BLUS]: This has been a great place to swim over the years for many people and usually has quite a few there, either for a quick dunk to cool off or maybe some primitive camping. PHOTO . LAT, LON lat=29.0608, lon=-81.6709(source: DeLorme) (accuracy: exact) LINK TO GOOGLE MAP. No fee. Facilities unknown. To get there: Take RT 19 south from the intersection with RT 40. Go about 9 miles to a small village and RT 573. Take RT 573 to the west (right turn). Go about 2 miles on RT 573 and look for a well-used road going to the north (right) (there is no sign). Take this road a short distance to the Blue Sink swimming place. Not verified. Pretty confident. Updated 2/22/2003. JUNIPER SPRINGS [JUNI]: Arises from a cavern at the bottom of a transparent pool and runs as a narrow stream for many miles. The spring is sensitively developed, a beautiful tropical setting. There is a platform you can jump from. PHOTO 1 , PHOTO 2 , PHOTO3 . There is a path through a shaded, tropical corridor with frequent views of the spring. You swim or snorkel only in the main pool, not the stream. Canoes can be rented (before noon) for a beautiful trip down the stream, you can also launch your own. Camping at site in very lovely, tropical setting. LAT, LON lat=29.18408, lon=-81.710(source: DeLorme) (accuracy: exact) LINK TO GOOGLE MAP. To get there: Continue west on RT 40 from RT 19 intersection to sign for Juniper Springs. Mostly highly confident, see above for exceptions. Mostly, see above for exceptions. Very lovely established swimming place in bend in river. Tannic (dark) water, Spanish moss overhead, docks to jump from. A short hiking trail follows the river until the entire river goes down into a sink hole and reappears 3 miles away. Alligators live in the sinkhole, adds some excitement to swimming so nearby! Sign says "Swimming area: Do not feed or molest alligators!" Yeah, OK.LINK TO STATE PARKS WEB SITE. Here's a memoir from a long-time O'Leno fan: "When I was a little girl the rangers kept a cage of rattlesnakes near the front of the park. The cage was made of wood, up on legs, and the open part was covered in fine mesh sturdy screen. I can remember not wanting to see them but still begging to stop. There was also a BBQ place right on HWY 441 at the Santa Fe River called Kemp's and they had a BIG bear in a little cage. Looking back it was cruel but at the time I thought it was great. The thing loved Pepsi Colas and you could hold the bottle up to the cage and he'd hold onto it with his paws and drink it right down. Just a little local trivia from 1950's Florida. Hope you enjoy !" At site, beautiful wooded sites. From Gainesville, go north on I-75 about 12 mi to High Springs. From High Springs, go north on RT 441 about 6 miles, the park is along the banks of the Santa Fe River. Swimming, snorkeling and scuba diving in State Park. Yes, about $4.00 per vehicle in 2010. From I-10 exit 283 (near Live Oak) take RT 129/51 southwest through Live Oak then RT 51 southwest then east (left) on 180th street a short way to Peacock Springs S. P..
PONCE DE LEON SPRINGS S. P.
Swim in beautiful, clear spring.LINK TO STATE PARKS WEB SITE Splendidly clear, an aquarium filled with guppies! Delightful park includes changing rooms. Get off I-10 at the town of Ponce De Leon, take US 90 east. The park is located .5 miles south of US 90 on County Road 181-A. 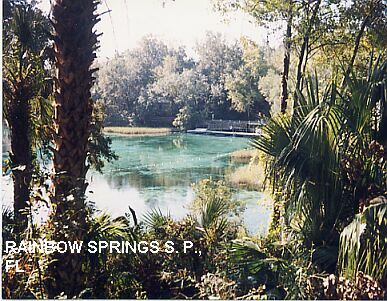 Rainbow Springs is a large spring and is the headwater for the Rainbow River. Can swim and snorkel (tube also but only at the campground) in the river. 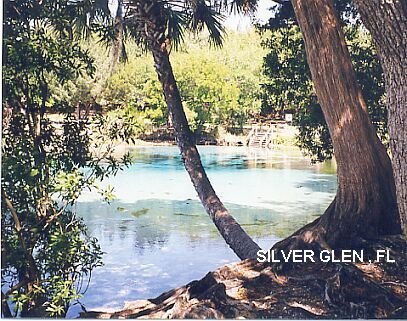 A beautiful park (used to be a private tourist attraction) and well worth a trip to visit this first magnitude spring and the Rainbow River, which is crystal clear over it's entire length. Great hike through the park also. Make sure your vehicle is locked and valuables secured. LINK TO STATE PARKS WEB SITE. (The following information from Mark A. Cook:)"Canoe rentals are now available at the Park (a concession). Photo identification is required. This is at the headspring. Available are canoes that seat up to four people, or single person kayaks. If one rents a canoe, they can paddle downstream past the boundary of the S. P.. Once out of the state park, one can swim and snorkel anywhere in the river. Although there is a private beach immediately below the state park, the river is public domain. It is the land access that is private, open only to residents of the Village of Rainbow Springs [a complex of subdivisions] and their guests. The one thing I would recommend is using caution not to get too close to the bank on the undeveloped side of the river, nor entering the lagoon at the private beach. My reason is that I have seen an 8 foot long alligator there on occasion... I have not seen this gator up at the swimming area at the headspring thankfully." Yes. The entrance fee into the park is $1.00 per person and the park is open from 8AM til sundown. Provided, but is a separate entrance off of RT 40, see Rainbow Springs Campground sign on RT 40 before you turn onto RT 41. From I-75 at Ocala take exit and turn west on RT 40, just stay on RT 40 and about 20 miles west of Ocala (past Rainbow Springs campground entrance) you will come to a T in the road and you will be at the intersection of RT 40 and RT 41. Turn left and head south on RT 41 and then you will see the entrance to Rainbow Springs State Park on your left, this is just a short distance and is well signed, take a left into the park entrance and follow the road east until you come to the RR. At this point you should see the parking areas for the springs on the left. After you park you will see the walkway that goes southward to the pedestrian entrance into the park. There is mostly shallow water on limestone shelves around the lower keys. The Ramrod Park swimming hole is an unusual deep place close to the shore which is a long time local swimming place and now is a park. In the Florida Keys, go south on A1A across the seven mile bridge, across Big Pine Key then to the small island of Ramrod Key (about 27 miles before you get to Key West.) On Ramrod Key, take Mako Ave. north (right), then Johnson Rd west (left) then Bay Shore Dr north (right) then Pruitt Dr. north (left) to the end of Pruitt Rd. on the north shore of the island. Here these is a place to park and swim at Ramrod Key Park. Long-time local swimming hole with rope swing. One of many swimming places in the South known as "Redneck Riviera". The county is trying to clean this place up with more organized parking and some rules, including no swimming at night. Please cooperate with this effort to keep this place available. 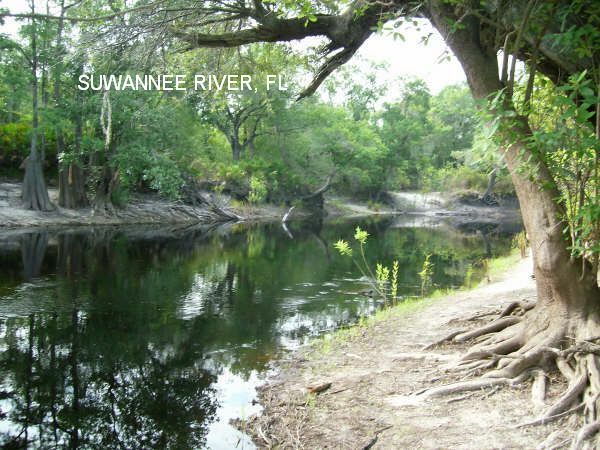 No camping at site - camp very nearby at Little Manatee River S. P..
From Tampa, take I-75 south about 25 miles then take exit 240B for RT 674 West toward Ruskin. In about 1.5 miles, turn south (left) onto 24th St SE and continue about 3 miles to the river. Not really a swimming hole, but an interesting snorkeling place. A bunch of rocks in the ocean form a reef that attracts lots of fish. Good snorkeling, good visibility, but be careful at low tide waves can knock you against the rocks.LINK TO PARK WEB SITE , GUMBO LIMBO WEB SITE , SURF CONDITIONS AND WEB CAM. The beach itself has expensive parking but Gumbo Limbo Nature Center across the street has free parking (so be sure to visit the nature center first!). See directions below for more details. Red Reef Park beach is in the ocean at Boca Raton. It's on Route A1A alongside the coast) between Glades Ave & Palmetto in Boca Raton. (A1A runs N/S parallel to I-95, Glades & Palmetto are both exits from I-95). Parking for non-locals is $ 8 weekdays and $ 10 weekends at all City-Owned Boca beaches. (There's a $ 2.00 State Beach and a free one also but not conveniently walk able to Red Reef from). Gumbo Limbo is a city-owned Nature Center on the inland side of A1A about 500 feet north of Red Reef. On days when Gumbo Limbo is crowded and the police are monitoring the parking, it would be inadvisable to try to park there. On other days, no one cares. Canoe .5 miles up Suwannee River to swim in beautiful, clear spring. Depth varies, sometimes quite shallow. From Gainesville, go west on RT 26. Before you get to Fanning Springs, in Trenton, turn north (right) on RT 129. Continue on RT 129 through Bell then go west (left) on RT 340. Shortly, RT 340 crosses the Suwannee River. Put canoe in here and paddle .5 miles north (upstream). The spring is on the east side of the river. Huge privately owned park on the Suwanee River. Often has musical events. A rope swing and several jumping points. Depending on where you jump or swing from, the drop can be from 10-30 feet. The water is slow moving and deep, and for some reason has a distinctive red color. 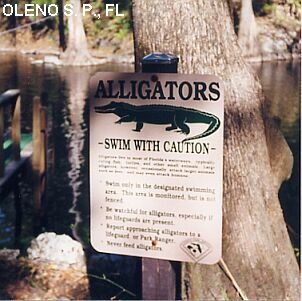 There are alligators in this river - see Alligator safety cautions. The area is unsupervised and has no posted rules. You can also go camping or canoeing here, probably for a different fee. Watch out for water moccasins on the river. Check web site for upcoming music events. Yes, about $5.00 per vehicle in 2010. 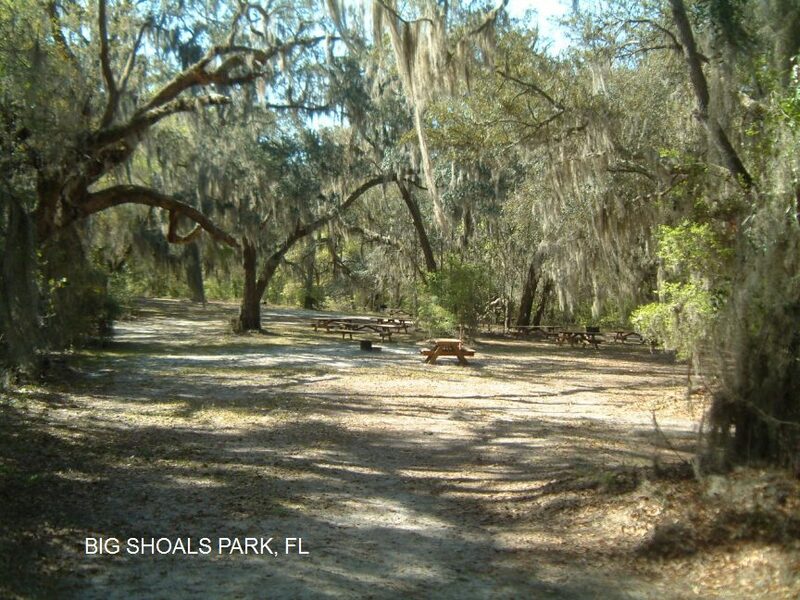 Park Entrance: 3076 95th Drive, Live Oak, FL 32060-8523. From I-75: Take Exit 451. Head South on 129/51 about 4 miles. Park entrance is on the right. From I-10: Take Exit 283. Head North on 129/51 about 5 miles. Park entrance is on the left. Once in the park: To get to the swimming hole, continue on the main road until it dead ends into a cul-de-sac. (About 1 mile.) Park in the cul-de-sac and walk through the gate. You will see a beach and a big river. You have to swim across the river to reach the jumping points and rope swing. Climb out at the waterfall. Prior rock quarry converted in 1923 into beautiful pool with Venetian style architecture. Major restoration in 1989. Is included in the National Register of Historic Places. Operated by City of Coral Gables; entrance fee. PHOTOS AND INFO. $5.00-$8.00 for adults, varies by season. 2701 DeSoto Boulevard, Coral Gables, FL. 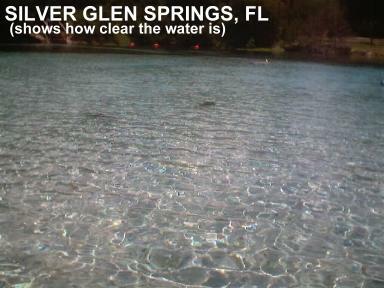 This description from a fan, "The water is crystal clear since it is fed by a number of incredible, beautiful springs. Since it's maintained by the County Government pretty much any thing goes and there are no fees or supervision. You can swim, snorkel, fish, boat, scuba dive, whatever. There is a diving platform and a rope swing. Also a boat landing but the water depth is suitable for only small boats, canoes and kayaks. The water temperature is 68 degrees year round. Anyway, this place blows away most of the other places you have listed under Florida as far as accessibility, natural beauty and water quality are concerned." 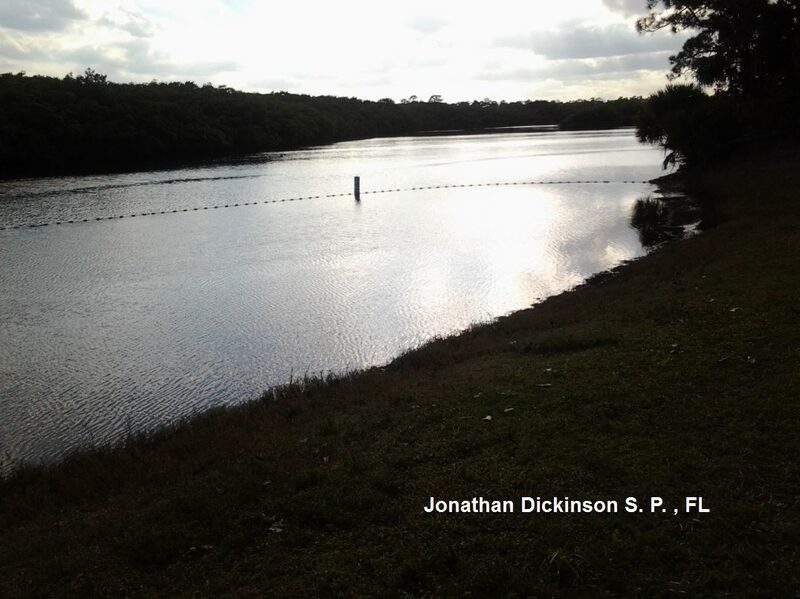 Another fan says:" I have to agree with the description of the Wacissa swimming hole. It is really beautiful and a pretty safe clothing-optional bet if you go after dark on a weekday. In fact, I have been at least a half-dozen times (all but one clothed!) and have only seen a few people. Additionally, if you go after dark, you should obviously bring a flashlight, it is pitch dark." From Tallahassee go east on RT 27 to RT 59. Turn south (right) and continue thru the town of Wacissa. When RT 59 turns west (right turn), continue straight for .25 mile to the river and springs. Plenty of parking and no fees. One of the largest and deepest freshwater springs in the world. Tarzan films made here. Great swimming in spring where glass bottom boat takes tourists. LINK TO STATE PARKS WEB SITE. Manatees and magnificent site. Fried-when-you-order-it chicken meal in the historic resort painted-beams dining room is not to be missed! From Tallahassee, go south on RT 267 about 14 mi to the intersection with RT 61. Follow signs. 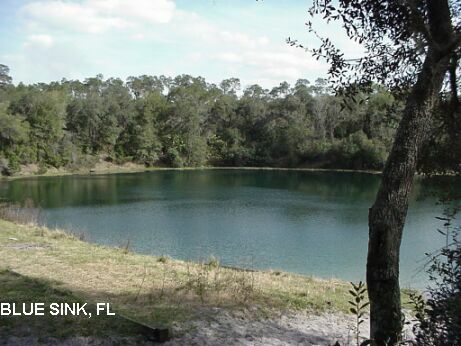 Very developed, commercial, historical warm mineral springs in sink hole. Said to be 87 degrees. Associated residential development. Day use available for fee. From the South: I-75, Exit 182 (Sumter Blvd. ), west to US 41. Turn right on US 41 to Ortiz Blvd. Right on Ortiz Blvd. and take to end. From the North: I-75, Exit 191 (River Rd. ), west to US 41. Turn left on US 41 to Ortiz Blvd. Left on Ortiz Blvd and take to the end.